There is a growing interest in protein hydrolysates. It has been shown that short bioactive peptides can have higher nutritive value, for example, as antioxidants. In the characterization of protein hydrolysates, it is important to analyse the size distribution. This is challenging with techniques such as RPC, or with SDS-PAGE as small peptides are not separated efficiently according to size. Superdex 30 Increase, in contrast, offers size separation of small proteins and peptides under native conditions. 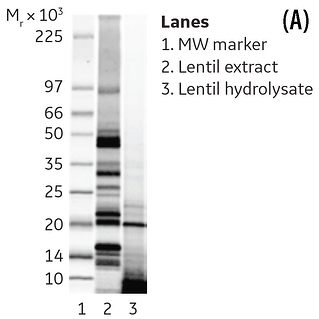 The figure to the right shows SDS-PAGE analysis of proteins extracted from lentils (lane 2) and a tryptic hydrolysate obtained from the extract (lane 3). The protein extract has been hydrolysed into small peptides, but these could not be separated efficiently. The hydrolysate sample was separated on Superdex 30 Increase, Superdex 75 Increase, and Superdex 200 Increase size exclusion chromatography columns. The figure below shows that the hydrolysate was most efficiently separated on Superdex 30 Increase with its smaller fraction range (Mr 100 and 7000). On the other hand, Superdex 75 Increase and Superdex 200 Increase are more suitable for separation of larger molecules such as the proteins extracted from the lentils. (A) SDS-PAGE analysis of lentil extract, lane 2, and lentil hydrolysate, lane 3. (B) Separation of a lentil hydrolysate sample on Superdex 30 Increase 10/300 GL, Superdex 75 Increase 10/300 GL, and Superdex 200 Increase 10/300. Sample: Tryptic hydrolysate from lentils; Sample volume: 50 μL; Buffer: 20 mM phosphate buffer, 280 mM NaCl, pH 7.4; Flow rate: 0.75 mL/min; Detection: 214 nm; System: HPLC. Superdex 30 Increase SEC columns are for high resolution analysis of small biomolecules with Mr ~ 100 to ~ 7000, such as peptides. Superdex 30 Increase is an agarose-based resin that is alkali resistant and supports cleaning-in-place (CIP) procedures which can increase column lifetime.